The block of the month for December is the Improv Quarter Log Cabin, from A Quilter’s Table. Find the tutorial here. Colors for this month are grey and yellow, and the size should be 12.5”, unfinished. Please bring your completed block to the next meeting! November’s block of the month will be a block lotto! For every block you make, you get a ticket. We will put all the tickets in a jar/hat/bowl and pull one (or two if we get a lot of blocks) and whoever has the winning ticket(s) gets all the blocks. This is smaller than our normal block and is 9" unfinished. As always, please leave the final trimming to whoever ends up with all of the blocks. The directions for the block are from Julie at Intrepid Thread, and she’s also got a printer-friendly PDF as well. We are using the fall tree colors (yellow, gold, orange, green, that strange reddish-purplely color some of the leaves turn) and the blue of the autumn sky with a cream background and dark stem. Karen made her samples for the blog photos using Kona bone and black, but anything similar would work. 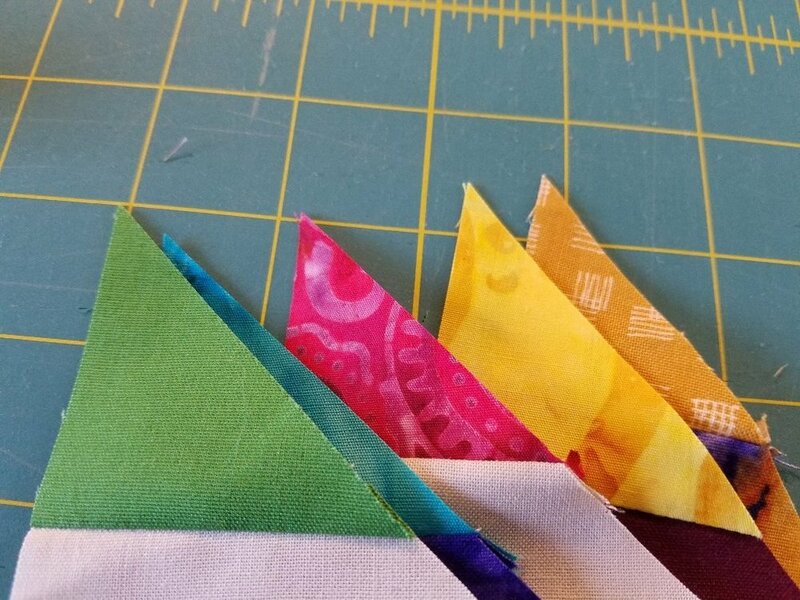 You can deviate a bit from the tutorial - Karen was using scraps and used anything from 1.5 to 3 inch strips. She also threw a cream strip in her leaves because she liked the way it looked in the quilt at the end of the tutorial. Please pay attention to the directional cutting of your strip blocks (see next photo) or you will end up with all left sides of the leaf (see last photo) and no right sides. 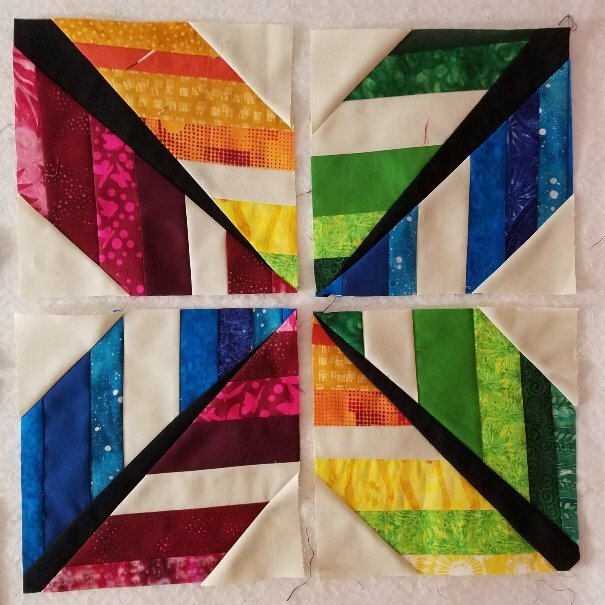 October’s block of the month is the New England Quilt block in yellows (bright, light, gold etc), oranges (bright, light, coral, peach, etc) for the corners and green for the cross and a white background. Think Autumn! The tutorial can be found at A Bright Corner, and the block should be 12.5” square unfinished. As always, please leave the final trimming to the wonderful ladies assembling the quilt top! August's block of the month will be the Bird Block. Your bird should be 12.5" unfinished, but as always, please leave the final trimming to the wonderful ladies sewing our blocks together! For colors: you can use any color for your bird bodies, but please use plain white for the background. The tutorial can be found here at the Patchery Menagerie, and Karen has taken some photos of the assembly process for us! The block on the left is what your finished block should look like - the layout on the right is an example of how your block will start out. June's block of the month will be the Disappearing Nine Patch, and using 4.5 inch squares the block is 12" unfinished. As always, please leave the final trimming to the wonderful ladies sewing our blocks together! For colors: your base color should be black, and your colors should be solid, saturated colors that would be appropriate for either a boy or a girl (gender neutral). For video tutorials, you can check out Craftsy at https://www.youtube.com/watch?v=ETZRhJtiFRA, or Missouri Star at https://www.youtube.com/watch?v=dEjZOXxPazg. Have fun, and we'll see you on June 21st!